Joseline Musiima was born on June 1, 2002. This precious little girl has been in our lives since she was two years old. Everyone who meets Joseline falls in love with her immediately. She is the youngest member of her family. She is from the Banyankole tribe. She is loved and looked after by everyone. Her other sisters are Catherine Nyesiga and Esther Mbabazi. When we first met Joseline, she was quiet and reserved. 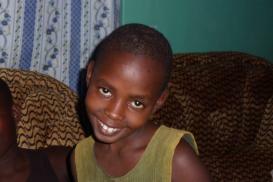 Everyone enjoyed working to get a big smile from little Musiima. Her father died of AIDS close to the time she was born. The mother is the second wife of a Muslim man. There were evil spirits and curses in the home. Her mother, Gorret Assimwe was very sickly with AIDS, but as she turned to the Lord, He miraculously healed her. Although the mother is not able to care for her girls, she has become a friend to Prepare the Way. She is an intercessor. We have encouraged her to keep a close relationship with her little Joseline. Joseline is young but is bright and responsible. When she was in "nursery class" she could read "pas-tor-bill-and-lean-da-camp-bell-pre-pare-the-way-min-is-try". I have carried her on my back for many a mile over the years to and from the field to play. She has a beautiful smile and is sure to win your heart. Joseline lives in the Lugazi area. She has become the debate prefect (top) and was the best performer in her class at school. She is surrounded by the family she has come to know and love. She is receiving much love and godly training.